Today is my birthday and the last day of my 42 Random Acts of Kindness project. 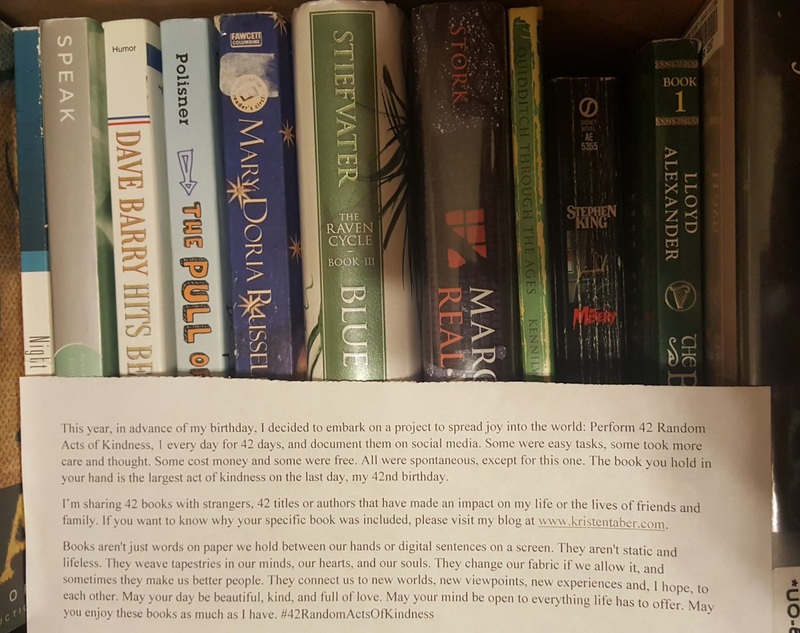 I've left a box of 42 books in the suburbs of DC for people to take and read on their commutes. Each of these books or authors have been favorites for me, for members of my family, or for close friends. The books and the reasons they were included are listed below. Links have been provided when I could find them. Books aren't just words on paper we hold between our hands or digital sentences on a screen. They aren't static and lifeless. They weave tapestries in our minds, our hearts, and our souls. They change our fabric if we allow it, and sometimes they make us better people. They connect us to new worlds, new viewpoints, new experiences and, I hope, to each other. May your day be beautiful, kind, and full of love. May your mind be open to everything life has to offer. May you enjoy these books as much as I have. My eldest's favorite animal has been a Panda bear since soon after she could talk. I included this stuffed book for a child who loves pandas as much as my daughter. As a little bean not much older than my eldest daughter, I received a set of Winnie the Pooh books from my great-grandfather. I read them until the spines broke and the pages turned brown on the edges. This book is included to honor him. Beautiful artwork that my girls loved to look at on a daily basis. We are a household that has more books than anything else (games, movies, etc.) combined. We have read thousands of books with our kids in their lifetimes, yet for bedtime when they were younger, they stuck with a handful of favorites. Some we read so often we memorized them. This book (along with Margaret Wise Brown's Goodnight Moon) was one of those habitual reads. The Little Blue Truck books have been favorites in our house for years (and still are), so I had to get a copy to share. Another favorite in our house, and a favorite of mine from my childhood. This series is excellent for teaching beginner logic, plus the kids find the characters' antics hilarious. I've included this particular book because my daughter will be starting school this year and school-themed books have given her comfort in facing the unknown. Another from the "If you . . ." series that my kids love so much. This one has dogs and donuts, two of their favorite things (like most kids their ages). My kids talk incessantly about birthday parties, plus a pig in a dress is apparently the cutest thing ever. It's easy to see why this is one of their favorite books. Mo Willems, I mean really, what else can I saw? Pigeon, Piggie and Elephant (Gerald)--they're adorable, awesome, entertaining, and even I love reading those books over and over again. Two thumbs up from everyone in the household. One of my childhood favorite reads. Whenever we got the chance to go to the library, I headed for the Frances books first. My girls have always been huge fans of Karen Katz's lift-the-flap books. At one point, I think we owned every title available (some with a lot of Scotch tape or missing flaps, but that's another tale for a different day!). This book, in particular, was a huge hit when they were younger. Acting out the kisses became a nighttime ritual for at least six months for each of them. We hope another family enjoys it as much as we did. Every generation has that one favorite cartoon that becomes their everything, where they have to ask Santa for every toy made, they dress as the characters for Halloween, and every birthday is decorated for that show. For me, it was Strawberry Shortcake. For my kids, it's Paw Patrol. And for the parents who chose this book, whose kids also can't get enough of the stickers at the back of the book--you're welcome! The funny, rocking, rhyming, precocious cat Pete had to make the cut because seriously, even I own a Pete the Cat raglan shirt. For White Shoes, we made up a tune and sing the book instead of reading it. Try it! It's fun :). Chicka Chicka Boom Boom will there be enough room? I could recite this one in my sleep (and probably have more than once). Catchy, fun, and a great way for little kids to learn their alphabet. My kids still love reading our copy. My children haven't quite gotten the same love of Peter Rabbit as I had as a child, but the books were some of my favorite reads (along with Little House on the Prarie and Winnie the Pooh) during the summers we stayed at my great-grandfather's rustic cabin in Maine. There's nothing quite like imagining that the rabbits hopping along the lake are friends with the animals I read about in my book. My friend Shawn asked that I include one of Patricia Polacco's books in my giveaway box. Shawn is a big fan and expressed that Ms. Polacco is an "amazing author of books for elementary-aged children." Her books "tell the human experience in ways that children can understand and appreciate. In addition to this, Polacco's stories include many of her life experiences and the experiences of her loved ones. I have never read a Patricia Polacco book that didn't leave me better for it." My friend, Shawn, is a teacher in metro Atlanta. She recommended this book for the box because it's a powerful story about hope, and it's especially poignant at a time in history when asylum seekers and immigrants are misunderstood and maligned. Another great recommendation by Shawn. For late elementary students (grades 3-5), there are few authors better than Eve Bunting. This story of a homeless boy, his father, and their make-shift extended family who live in an airport is a favorite for Shawn's students. Gae Polisner is a fantastic writer of thought-provoking books and a beautiful human being. Definitely had to include one of her books in this box! My friend Bekki asked me to include two books that made an impact on her. This is one of them. When I asked her why, she said, "Long before #metoo gained traction on social media and in our cultural experience, Speak became the book that helped many young people find a way to voice their experiences. The protagonist's struggle to find words for what happened to her is set across a backdrop of any town high school. One night changes everything. For anyone whose voice has been silenced, and for those of us who need to learn how to listen." J.K. Rowling. Of course. Abso-fricking-lutely of course. Harry Potter was the first book in a long time that I stayed up all night to finish. There's a reason this imaginary world owns so many hearts, even so long after being published. This book is the second that Bekki asked me to include. In her words, "Marcelo, our narrator, is different. He has autism. His father is a successful lawyer and is done letting his teenage son hide in his special school, separate from the world. Marcelo and his father strike a deal. Marcelo must work at his father's law firm, and navigate the real world according to the rules of the real world for the summer, and then he can choose what school to attend his senior year. Alongside Marcelo, the reader struggles with navigating the unwritten rules of the world, then a picture turns it all upside down. This book is a coming of age story with a twist. A boy who lives in the binary--the yes or no, the good or bad, the black or white--becomes a man who understands nothing is one or the other. Marcelo in the Real World is a lovely book about perception, loss, and living life to its fullest. It will get under your skin when you least expect it." Maggie Stiefvater is a wonderful author with a vivid imagination and an impressive gift for painting pictures with words. Plus, she's a fellow Virginian so I couldn't resist including her in the box (one book for each reason). Of course, this is my first published book. I'm not including it for that reason though, but because I now have so many wonderful friends in my life who I never would have met had I not published this series. 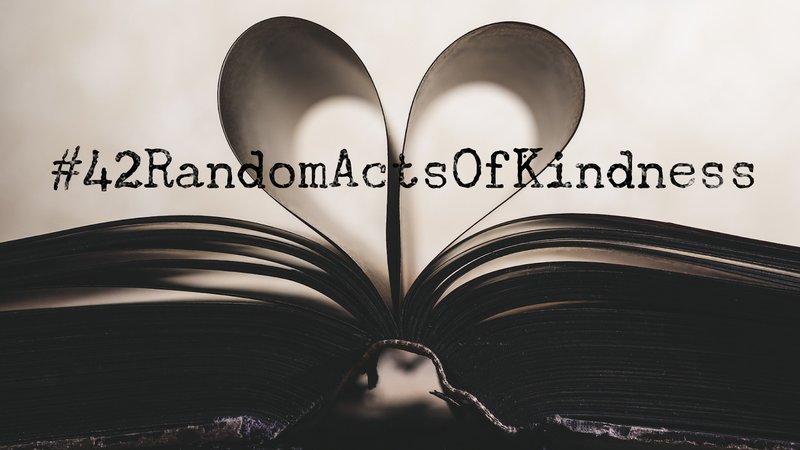 Since I started the #42RandomActsOfKindness project partly as a way to count my blessings and remind myself of the gifts that matter in my life, it seemed fitting to include the book that brought so many unexpected blessings with it. When I met my husband half a lifetime ago, Peanuts was one of his favorite comic strips. Gifting him something from Peanuts has become an annual tradition in our relationship, so in the box, this goes. During high school, I had a summer job babysitting a 1-year-old while his mom worked. She bought her husband a copy of The Lord of the Rings for his birthday, so I read it every day while the little boy slept. Devoured it, actually. I fell in love with fantasy thanks to J.R.R. Tolkien. My husband's other favorite comic strip, and one of mine (alongside Pears Before Swine). These panels still crack me up when I read them. Growing up in Bangor (and outside of it in a small farming community), big cities terrified me until a few years after I moved to the DC area. I have since, of course, fallen in love with the convenience and culture. One of the first memories I have from shortly after I moved here was finding a little print paper called The Onion, a satirical mesh of political and social stories that had me laughing out loud on the trains as they rushed under the city streets. I looked forward to each new issue and every metro ride when I could grab a copy before taking the escalator underground. Love Jon Stewart, love the Daily Show, and love their ability to mix thoughtful messages with comedy. I met one of my closest friends because I published my Aerenden series and donated copies of my books to a charity where she worked. I've included Ender's Game for her since it's one of her favorite books, and it reminds me of her every time I see it. A compelling look at a dark time in our history we should never, ever forget or we, as susceptible human beings, will repeat it. English class in high school posed a problem for me every year. While my fellow students complained about having to read the dusty, boring books from way before our time, I ducked my head over my desk and tried to avoid the conversations lest my classmates discover I was the oddball. I loved those books, every last "boring" word, the pictures they created, and the subtle questions they posed. Some I forgot about years after I graduated, but The Red Badge of Courage (and a handful of others) haunts me to this day. A thought-provoking, heart-in-your-throat book written with gorgeous imagery, an inventive new world, and engrossing characters. A recent find for me, and one of my favorite sci-fi books. Back when we read the paper every morning after it landed in our driveway (before the internet became commonplace for news), I lived in Florida and devoutly read Dave Barry's humor columns. From hot and humid Florida I moved to (not quite as) hot and humid Northern Virginia. This book hilariously connects my two life stops. I love Mr. King's writing, of course, but as a Mainer, this box would feel woefully incomplete without one of his books. Misery is a classic. As a teenager, before my first long plane ride, my mother took my sisters and me to the local bookstore and told us we could buy any book on the bargain table for the trip. I found this one and from that moment on, I was a fan. While The Lord of the Rings made me fall in love with fantasy, The Ruby Knight made me want to write it. My grandfather came from a line of Irish immigrants and loved all things Irish in respect to his heritage. Traveling to Ireland to connect with cousins, collect stories, and explore the land where his relatives had been born--and he always felt his heart belonged--became a source of stories for decades. As all things in his life ultimately were. He often said proper storytelling was of utmost importance. (Make 'em believe it or don't bother.) Last year, my grandfather moved on to spinning yarns with the angels. He was my inspiration, so I've included this book in his honor. My favorite job to date was (unsurprisingly) working in an office in the back of a Barnes & Noble College Bookstore. The division I worked for treated their employees well, and the people I worked with were fun and loved books as much as I do. I worked there for seven years until I moved out of the state. In that time, they invited me to their annual shows (purchasing, showcases on upcoming books and trends, award events, etc.) whenever they took place close to where I worked. The first time I attended, a friend and co-worker tugged on my arm to accompany her to the author signing table. During the event, the company flew in authors to sign books for employees. "How much?" I naively asked. "What? They're freeeeee," my friend sang giddily. I went home with an armful of heaven. The first book I had signed? A title from the Weird series. So, of course, I had to include one today (sorry, not the signed one though!). 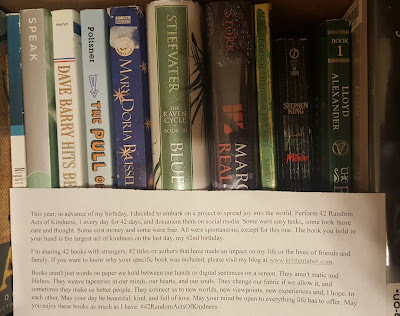 For everyone who selected a book from the box, I hope you enjoy it and pay the kindness forward. For the rest of you, I hope you check out these titles and authors and maybe find some new beloved reads. Now, off to celebrate my birthday!